Here at Rhine Valley Game Calls we offer a large selection of Floats & Bobbers for your Fishing Needs. Everything from Standard to Lighted Floats and Bobbers are always in stock. Comal Tackle Assorted Round Floats. Outdoor Angler 1-1/4" Round Floats. Outdoor Angler 1-3/4" Round Floats. 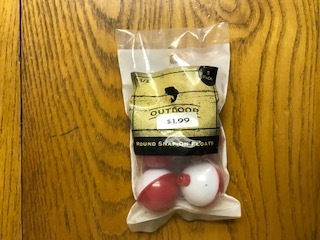 Outdoor Angler 2" Round Floats. Night Bobby Lighted Fishing Float (Red). Night Bobby Lighted Fishing Float (Yellow). Rod & Bobb's "The Original" Glow Bobber 1-1/2"
"The Original" Glow Bobber 1-1/2". Rod & Bobb's "The Original" Glow Bobber 2"
"The Original" Glow Bobber 2". Tackle Beacon Bell-Lightstick Combination Refill Kit.